This I Believe is an international project engaging people in writing, sharing, and discussing the core values that guide their daily lives. And it all started in Philadelphia more than seven decades ago with a local radio series that became an international sensation. This book features thirty essays from that original 1950s This I Believe radio series, including contributions from publisher and philanthropist Walter Annenberg, classicist and educator Edith Hamilton, anthropologist Margaret Mead, and Pulitzer-winning author James Michener. Complementing those historical selections are thirty contemporary essays produced through a partnership among This I Believe, WHYY, and Leadership Philadelphia. These essayists include Philadelphia Inquirer columnist Frank Fitzpatrick, Grammy Award winner Kenny Gamble, Philadelphia Mural Arts Program executive director Jane Golden, and Mayor Michael Nutter. 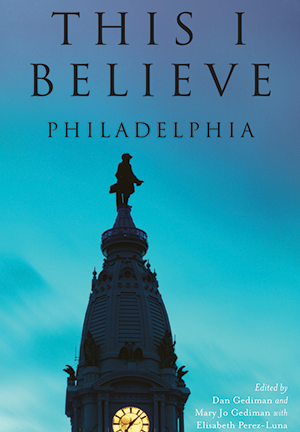 Altogether, this collection is an insightful reflection of the guiding principles that drive the people of Philadelphia, who believe in brotherly love—and so much more. Dan Gediman is executive director of This I Believe, Inc., a nonprofit organization that engages people in writing and sharing stories describing the core values that guide their daily lives. These short statements of belief have been featured on public radio, on the web, and in print since 2005, and the essay collection of more than 150,000 statements of belief can be found at thisibelieve.org. Gediman is the coeditor of the New York Times bestseller This I Believe, as well as This I Believe II and six other collections of This I Believe essays. A thirty-year public radio veteran, his work has been heard on All Things Considered, Morning Edition, Fresh Air, Marketplace, Jazz Profiles, and This American Life. He has won many of public broadcasting's most prestigious awards, including the duPont-Columbia Award. Mary Jo Gediman has worked in professional communications for more than twenty-five years as a writer, editor, and project manager. Since joining This I Believe in 2006, she has worked collaboratively to extend the reach of the project into secondary schools, colleges/universities, library systems, public radio stations, newspapers, and local communities nationwide. Gediman is an editor of the award-winning This I Believe website and is co-editor of the books This I Believe: On Love, This I Believe: On Motherhood, This I Believe: On Fatherhood, This I Believe: Life Lessons, and This I Believe: Kentucky. Elisabeth Perez-Luna has been working as a journalist and independent audio producer for National Public Radio and other news and documentary networks for several decades. She has been at WHYY since 1999, first as news director and now as the executive producer of audio content. She is the producer of special series such as This I Believe-Philadelphia, Impact of War—Pennsylvania, and other programs, sound portraits, audio environments, and features for radio and web. Perez-Luna has received numerous awards for her national and regional work.